Here you should find all the information you need and we need to make your ideas a reality. If you have any specific questions, or think your project may have special requirements it is always best to contact us first before putting in an order. There are our most commonly used binding methods, with information on the pros & cons and some consideration on file setup. We use other binding styles for certain projects and will be happy to take on the challenge of another method, just get in touch to discuss the options. If you’re unsure of what you need, or what will work best for your project we’re happy to discuss all aspects of book design, production and binding and can advise you on layout, print order and the best structures that will work best . This is one of the most durable and high quality binding methods available, and is appropriate for a huge range of projects. The book is sewn together in sections (gatherings of folded sheets) before being covered in a custom made hard cover. Covers can be made using a wide range of materials and finishes to work with your project. This type of book is sewn on an industrial sewing machine, leaving little visible stitches on the page which can be in a choice of colours. Books sewn like this can have a paper cover which will leave the stitiches visible outside, or a hard cover can be made which hides the sewing. Maximum page count – varies depending on the type and thickness of paper – the higher the weight, the fewer pages and vice versa. This adhesive free method also uses an exposed spine to make a feature of the sewing. Pages open completely flat, and the sewing can follow a simple or very elaborate pattern. This adhesive free method has been used in Asia for thousands of years. The method makes a feature of the sewing, and endless sewing designs can be incorporated into the design. These books can be made with hard or soft covers, including loose fabric. Traditionally bound using folded pages sewn at the open edge rather than the folded edge, this method also works with single pages. File set-up – as single pages. 1cm – 3cm will be lost in the gutter, depending on the sewing pattern, so this will need to accounted for in the book design. This adhesive free method uses an exposed spine to make the link stitch visible once the book is bound. Covers can be made of board, card, wood, acrylic etc. We use a cold glue perfect binding method. This is an option for binding single sheets that need to open flat, or for making an A3 landscape book where the cost of printing in sections would be prohibitive, for example. This method can have a hard cover or a soft cover. It’s best to use uncoated paper that’s on the thinner side – ie a heavy card or a tracing paper may not last as long. We don’t use hot glue in our perfect binding, but can outsource it if we think that it would be more suitable for your project. Hot glue perfect binding is slightly stronger, but does mean that the pages won’t open flat. We can use screw posts to bind single pages, plastic sleeves or different materials, including fabrics. This is a good option for fabric swatch books. Screw posts can be positioned to allow the book to open along a traditional spine, or just at one corner to allow the pages to fan out. File set-up – as single pages. Around 2.5cm will be lost in the gutter, so you’ll need to account for this in the book design. 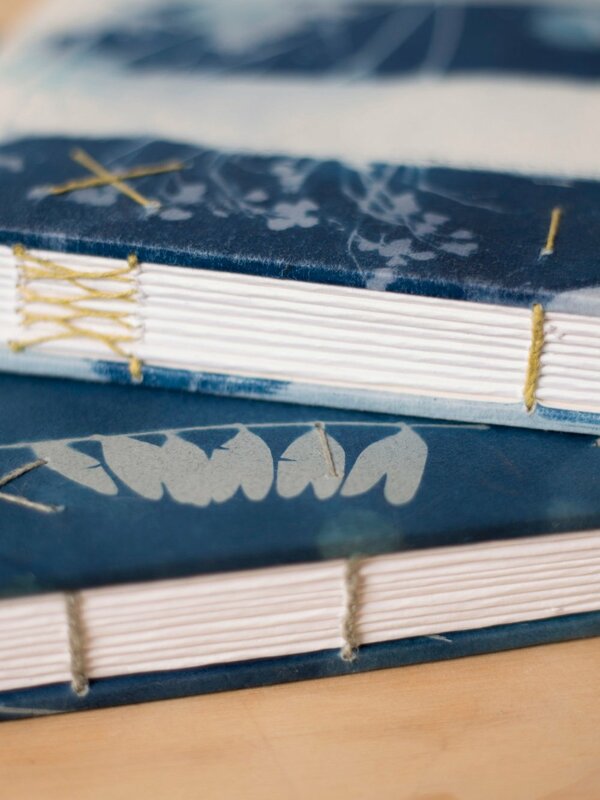 This method sews the book together in a single section, hand sewing the pages with linen thread. This method can be sewn with a paper or hard cover. This type of binding involves sewing the pages together at the gutter through the spine. As it doesn’t open flat, it’s best not to use a very thick paper. We regularly make boxes to custom fit books and other objects. 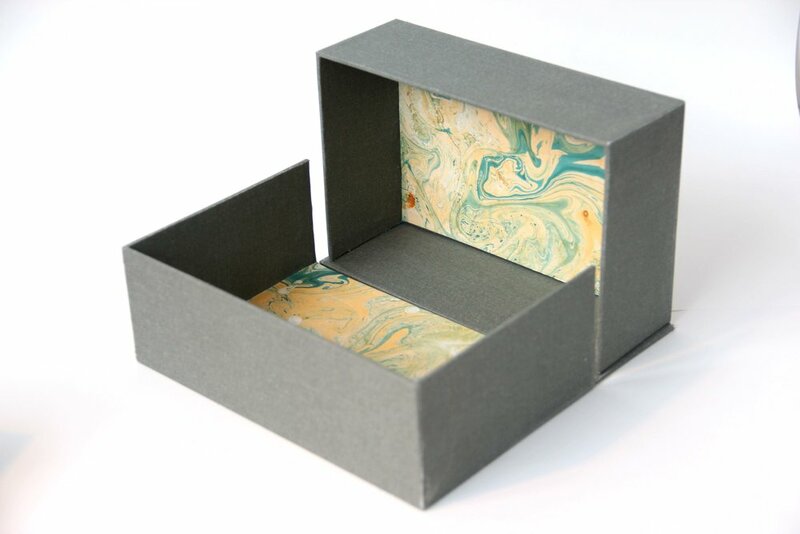 Boxes can be covered in bookcloth, as well as paper or fabric if it’s suitable, and can be lined with decorative paper, a printed design, bookcloth or suede. Recesses can sometimes be built to house an object, and ribbons can be incorporated to make items easier to remove. Magnets and ribbons can also be incorporated to a box closure. As our boxes are custom made to fit a particular object, book or print, it’s best if we can have the object itself to measure from to ensure a perfect fit. Also known as a clamshell box, solander box or tray box, these boxes can be made to house books, prints, USBs or other objects. As it’s made up of several parts, several colours can be used in one box. 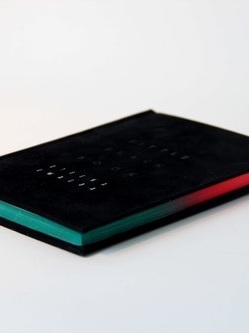 A slipcase is a sleek box option that has one side open, leaving the spine of the book, or books, visible. Foiling is possible on either the spine or sides. Drawers can be incorporated into a dropback box, or a box can be made to house an object alone. We source as much of our materials as possible from Scotland. All of the paper we use in our journals is recycled and milled in the UK, and we use Coats linen to sew our books. We work with a range of specialists to source custom materials. All of our books are sewn with Linen thread, due to it’s strength, longevity, and the fact that the cellulose fibres will expand in humidity at the same rate as paper. We have a variety of thicknesses in house, and also have a wide range of coloured linen thread that we can use in a project. The paper that’s appropriate for your project will depend on what’s best for your prints and for the binding method. In general, something between 70gsm and 170gsm will work for most of the binding methods above. Thinner paper is best for a structure that doesn’t let the pages open fully. If your book has a small page count and you’d like it to look bigger, you can use a thicker paper. If your book is being section sewn (Coptic, section sewn case binding, long stitch etc) then a thicker paper will mean that you should have a smaller amount of pages per section (for example, a thick paper will be best is 2 or 3 sheets per section. A thin paper will be better with 4, or even 5 pages per section) If you have a small page count but want to make the most of an exposed spine method on a section sewn book, you can print 1 sheet/4 pages per section on heavy paper (200gsm+). Our stock bookcloth is a matt linen bookcloth that’s available in a wide range of colours. See our stock colour chart for our standard colours. We’re also happy to order in specialist colours or materials. A waterproof and very hardwearing bookcloth with a shiny finish. A soft matt bookcloth with a fine weave. Not waterproof and can mark easily, so is best used on books that won’t get a lot of rough handling. A textured matt book cloth with a slightly textured finish. Not waterproof. We have a range of serif and non-serif type in-house, as well as a wide range of foil colours. If you’d like a specific typeface or size then a custom metal die can be made up, the price of which depends on the size. Dies can also be made up of any design, we’ll just need a file of your design. All files should be supplied as you want them to look i.e. black on white and right reading. EPS, PDF, ai or Tiff’s preferred. We are generally able to work with supplied materials but would recommend you bring in a sample beforehand so we can check its suitability for lettering, pressing, and use with our glues. Please note that bringing extra material for the actual job is essential. As well as our range of in-house cloths in-house that are tried and tested, and we can also source specialist materials for your project. As well as cloth, paper or fabric, we also bind books in full, half or quarter leather, if you need something real fancy. We often bind books in unusual materials, including fabric, prints, acrylic, wood and cork. We’re happy to bind books in your materials if it’s possible. We’d need a small sample of the material before we undertake the project, to make sure that it works with our foils, glues and pressing methods. When working with a supplied and unfamiliar material, it’s best to have extras in case it doesn’t work with our materials, or to make sure that you can supply/print more in time for your deadline should anything go wrong. We don’t print books in-house as we believe that should be left to the print experts. However, we work with trusted companies across Scotland using a range of print methods, and will be happy to advise you if you need a printer. For a large book where printing would need to be over SRA3 (for example, and A3 landscape book would require SRA1 prints) printing in sections can be prohibitively expensive, so you may want to contact printers for prices or investigate all binding methods first to decide what’s possible within the budget. It’s very difficult to register a print in exactly the correct position when printing double sided. If your book features full bleed images, then in the case that the printing hasn’t been registered exactly, we will therefore have to fold an image in a way that may not be how it was intended before printing (ie, 1mm off where it was intended) In this case, we’ll use our judgement and experience to choose which registration mark will cause the least disturbance to your design, and give the best result. If your pages are full bleed, depending on the paper and printing process, some of the print may come off where the pages are folded. This is more likely with a laserprint on gloss paper and most visible on something with an exposed spine, for example Coptic binding. When folded sheets are gathered together into a section, the inner pages will be pushed slightly farther out at the foredge. We’ll usually trim the page edges to be the same size, so this means that the inner pages of a section will be slightly smaller than the outer pages, so you may have to account for this in your page design. It’s best to speak to the printer that you’re working with as they might have different specifications on what they’d like. Most printers will usually ask for you to supply your book as a pdf, set up as facing pages, and with crop marks, but do check beforehand. 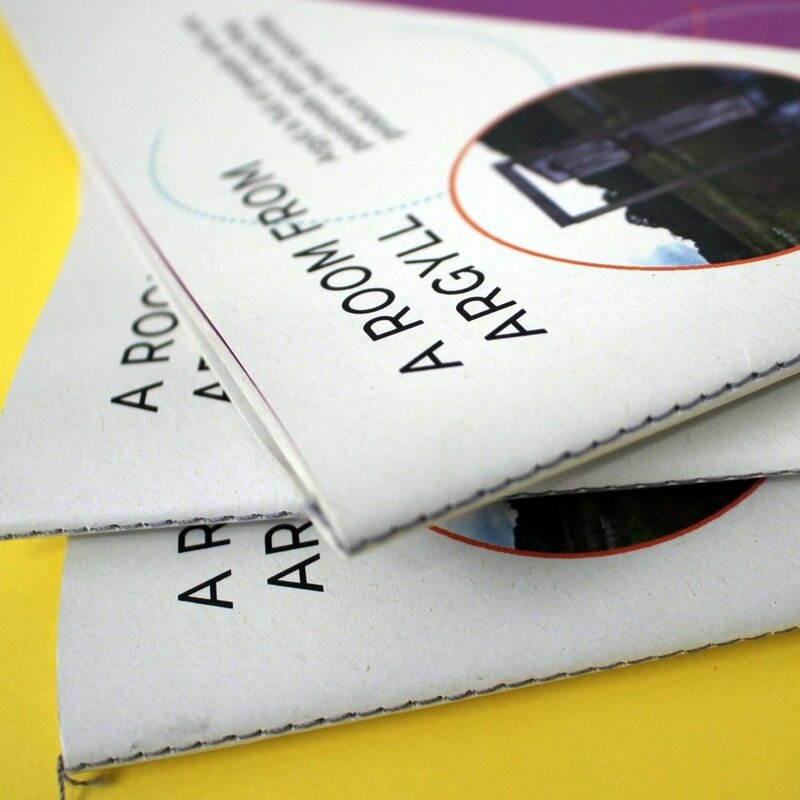 We prefer prints to be supplied folded if possible, but we can offer this service. We can give some advice on file setups, and if you need us to digitise and setup a document from start to finish we can do this at an additional cost. As everything is bespoke, we aren’t restricted to A sizes, so we can work with any format (ie square, 4:3 etc). As everything is bespoke, nearly all aspects of the project are variable. With that in mind, it’s great if you can give us a clear idea of what you’re looking for. You can start by filling in the form online sharing the details of your project. If we need to discuss your project or you want to look at samples, you can book in for a 45 minute consultation where we’ll discuss your project and talk about materials and methods. We’ll then confirm the price and T&Cs, and once the prints are dropped off/files are emailed for print we’ll get working on your project. We regularly work to tight deadlines, and understand how important it is to have a project turned around on time for you. We usually ask for around ten days to bind your project, but if you have a tighter deadline we can work with that too, it will just incur a rush fee. It’s important to have a bit of time in the case of making boxes or using a supplied and unfamiliar material. If your project is due back at a busy time, ie Degree Show, then it’s a good idea if you can get in touch at least a month beforehand to make sure that we have all materials in stock, and that your prints will be ready to go, and to iron out any problems before we start binding.